In 1988, Architect Joseph Cincotta and Julie Lineberger, started LineSync Architecture, an award winning firm currently with 9 employees. Wheel Pad L3C, their second enterprise, evolved from an accident in 2010 that rendered their Godson quadriplegic and forced to live isolated in an accessible hotel room for eight months after rehab until he could find appropriate housing. While designing the universally accessible renovations for a home their Godson eventually purchased, Joseph came up with the idea for Wheel Pad and started building the prototype in 2015: A 200 sq.ft. accessible bedroom and bathroom that can be attached to an existing home. 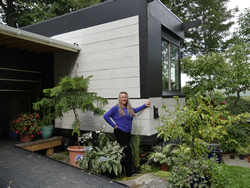 It provides eco-friendly, temporary, accessible housing for people with mobility issues, allowing friends and/or family to provide support until permanent accessible housing can be arranged. Permanent models are also available. Wheel Pad L3C offers a housing solution for disabled Veterans, Seniors, people with spinal cord injuries, and multiple diseases (ALS, MS, etc.) who have mobility issues and/or use wheelchairs, who want to remain in their currently inaccessible homes. It is an elegant solution that alleviates the need for a 6-12 month process of planning, designing, and constructing an addition. Additionally, it is local; it serves a social issue as well as an economic one. Their plan is to manufacture Wheel Pad units in economically depressed Wilmington, VT, with the end goal of an employee-owned enterprise. For more about Wheel Pad L3C, check out www.wheelpad.com, and for more about VtSBDC visit www.vtsbdc.org. To find your local SBDC, visit americassbdc.org/home/find-your-sbdc.